The period known as "The Disney Renaissance" is generally considered the 10-year period beginning with The Little Mermaid in 1989. While the final three movies of Hercules, Mulan, and Tarzan fall within that time, they don't have the same reputation as the earlier blockbusters. They have limited representation in the theme parks and aren't regarded as classics like Beauty and the Beast and The Lion King. I grew up with the Disney films and caught the big '90s movies in the theaters. By the end of this golden age, my interest waned and caused me to miss the last three releases. I'm calling that era the "Post Disney Renaissance" since the movies don't have the same acclaim. Each has its share of fans, yet the general feeling is different about them. This trio offers the perfect opportunity for a short marathon. Also, my daughter Elise is three-and-a-half, so this gives me a chance to watch them with her. I'll be documenting her reactions in each post since she hasn't seen them. As a Disney fan, I'm excited to catch up with a blind spot in their history. The first selection is 1997's Hercules, which I knew little about before this viewing. Hercules (Tate Donovan) is born on Mount Olympus to Zeus (Rip Torn) and Hera (Samantha Eggar) and is set for the life of a God. Unfortunately, Hades (James Woods) has other ideas and tries to eliminate the new baby. The Fates have shown Zeus' evil brother that Hercules will squash his plans to release the Titans and take over the world. The boy survives the attack but is now part-mortal and living on Earth. His mentor is Philoctetes (Danny DeVito), a satyr who's trained star heroes like Achilles. Hercules grows up and learns how to fight and save people from monsters. He becomes a celebrity and is very popular, but he may be set for something greater. Meanwhile, Hades learns his whereabouts and schemes to take out this final obstacle. A key part of his plan is Meg (Susan Egan), a brash young woman who's caught Hercules' eye and could give Hades the chance to take him out. Is Hercules on par with the most popular movies from the Disney Renaissance? Not really. The marketing pushed the fact that it was based on mythology, not a fairy tale. It's interesting to see them taking a different approach, but the results are bland. Following the surprising adult themes in The Hunchback of Notre Dame, this feels like a step backwards. It's the standard good vs. evil story where the brave hero stands up to danger and saves the day. I enjoyed the sequence when Hercules becomes a celebrity and starts taking out all types of monsters. In a strange way, this mirrors the opening "Eye of the Tiger" sequence in Rocky III and shows the commercialism around the guy. He transforms into something different than a hero who wants to go home. While I don't expect an in-depth look at celebrity in a kids movie, this brief stop helps this typical adventure. Snappy dialogue from James Woods' Hades and Susan Egan's Meg livens up the proceedings, but they can only do so much with such a bland hero. 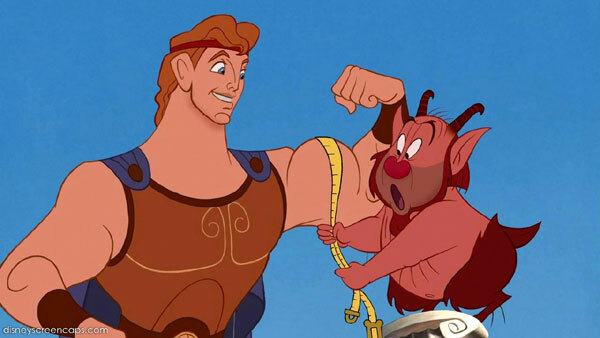 Hercules arrived at an interesting time when animation was incorporating more CGI but hadn't yet transitioned to it. This gives it a strangely dated style because it feels closely tied to the late '90s. Unlike the classics of Disney's past, it uses hand-drawn animation but looks different. It's obvious that serious care was put into the movie, but it falls short of other stunning Disney films. That said, there are still some impressive sequences. The highlight is the battle with the hydra, who regenerates two heads for every one chopped. Hercules is oblivious at first and keeps eliminating the heads, which is not wise. This creates a massive enemy that seems indestructible and looms over the little guy. It's an exciting sequence that gives the story a much-needed boost. While it's fun to watch Hades scheme to take him out, we don't really care if Hercules saves Olympus or not. One of the most intriguing parts of this movie is its approach to music. It has the Oscar-nominated ballad "Go the Distance" and songs written by Alan Menken, but it feels different. The Muses act as the narrators of the movie and sing R&B and gospel-themed tunes. Those performances are effective and bring life to the story, but they aren't matched by the other tracks. It's possible the changes come from David Zippel, who hadn't worked on Disney films in the past. That's probably a simplistic look, however. Zippel is an accomplished composer, yet the songs never really find the right tone. The music is professional, however, and most of the issues come from comparisons to predecessors. It isn't easy to keep topping music that remains beloved long after its original release. For the first 20 minutes, Elise was engaged and enjoyed the baby Pegasus. Once Hercules reached Earth and the story started rolling, she quickly lost interest. A few days later, Elise responded to my questions about liking it with a succinct "no". She did call out the baby Hercules as a favorite part, so she may have enjoyed a Muppet Babies-like spin-off. One exception was the Ricky Martin video for "No Importa La Distancia", his Spanish-language version of "Go the Distance". I checked it out since there were few DVD extras, and she requested it two more times. It's hard to compete with a cheesy ballad sung in a different language. I will say that it's a lot better than Michael Bolton's rendition over the credits. Unfortunately, the characters from Hercules haven't enjoyed a long-standing place in the theme parks like Simba, Belle, and others. They used to appear at meet and greets but have been retired due to lack of interest. A "Hercules Victory Parade" appeared for a year at Disneyland in 1997, but it's faded into the background. While it's an okay movie, the fact that Disney hasn't retained the characters in the parks shows its lack of staying power. They created a straight-to-video sequel and TV series, so it was hardly a big loser. The burden of high expectations is too much for this movie to overcome. It's worth checking out for animation fans, but it doesn't rank among the must-see Disney releases. Next week, I'll venture across the pond to China and check out Mulan. I saw this movie in the theater and liked it a lot more than you did, but I also haven't seen it in at least a decade. 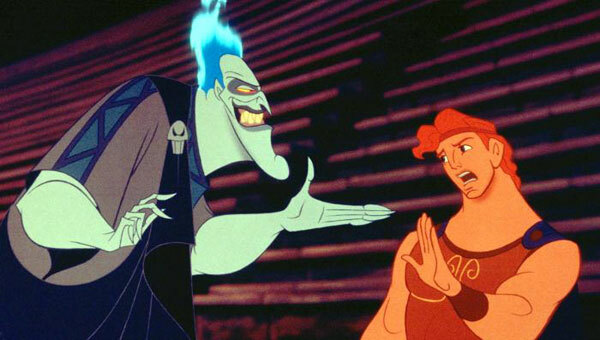 I remember really enjoying both Meg and Hades (though not so much the Danny DeVito character). I also went to Disney with my family shortly after it came out, so maybe all of that is tied together in my head. Regardless, it probably isn't as good as all that, but I liked it more than Pocahontas or Hunchback. Mulan is really good though. I think you'll enjoy that one. Tarzan has some really strong points but is nearly derailed by the typical Disney wacky sidekick, voiced by Rosie O'Donnell of all people. Joel, I'm guessing that I might have enjoyed seeing Hercules more in the theaters back in the '90s when Disney's animated movies still had that event status. I agree that Meg and Hades are the best part of it, but a lot of it just felt awkward. The animation just wasn't that exciting, either. Not to spoil too much about next week's review, but I'll admit that Mulan was a definite improvement. I haven't watched Tarzan yet and actually know very little about it, but your comment isn't making me excited for that character. The great thing about Tarzan is Jane, who is just an awesome take on the Disney heroine--voiced by Minnie Driver, who (unlike Demi Moore) earns her celebrity casting. I told you on Twitter that I liked Hercules, and part of that is because it came after Hunchback. To me, Hunchback trod an uncomfortable line between Oscar-bait grown-up material and children's movie. If they'd made it as an outright animated movie for grown-ups (which would have been an interesting gamble back then), I'd probably have loved it. Instead, we got this kiddie-friendly pat resolutions and comedy, with some out of place, adult themes. But Hercules was unashamedly fluffy in nature. It's probably better compared to Aladdin, since it's by the same directing team, and one of the comparisons between the two I've liked the most is that Aladdin's genie is the funniest character by far, but Hercules' humour is spread out more evenly over the entire cast. Hades is good, although I always felt it was a bit of a cop out using the God of the Underworld as a villain, but Meg is great. She was the first Disney heroine to be funny in her own right--before, the girls got the good songs, not the good lines (Jane takes this a step further, since we're encouraged to laugh *at* her). 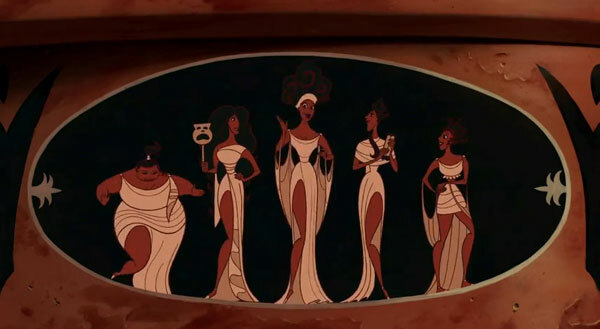 The Muses are probably the number one reason I love this film though. They're amazing, even if there are only five of them. 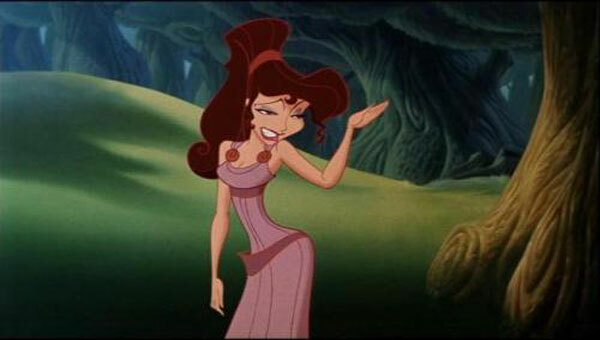 Plus I'm a big fan of Alan Menken's music, so any time the muses are on screen and singing, I'm a happy girl. I suppose for me it's not so much that Hercules is a great cohesive movie as that it has so many things that I get a kick out of. Mulan is definitely one of the great ones--I need to watch Brave, because I suspect that Mulan will feel dated after that, but I love Mulan. I like Tarzan too, which is ambitious and doesn't quite achieve what it sets out too, but I respect it for trying. Sarah, thanks so much for the long comment! I've only seen Hunchback once back in the theaters, and I really enjoyed it because it tried something different. I felt like it was better than Pocahontas, which did seem awkward in trying to mix the adult themes with kids' stuff. I wonder how I'd respond to both if I watched them again today. On Hercules, I did enjoy the Muses and liked the opening where they interrupt the serious Charlton Heston intro. That part of the music was good, but the other songs weren't very memorable for me. I'm guessing that I would have enjoyed Hercules more during the run of Disney animated films back in 1997. Seeing it now, it just felt disjointed. There were some good elements like Meg and Hades, but it didn't come together well for me. I'm familiar with Little Shop of Horrors, though I haven't seen it on stage or beyond a few movie clips. It's interesting that there are some connections between the two movies. I'll be curious to hear your reactions to my Mulan post next week. Like I said in the comment above, it was a big improvement for me over Hercules. I must have been 16 or so when I first saw Pocahontas with friends and I remember thinking it was the most amazing romance ever. I rewatched it a few years back and... not so much. But I still have a soft spot for it, for teenage nostalgia. Perhaps that makes it the Twilight of Disney movies? Hunchback, on the other hand, I took my younger cousin to see, and I felt embarrassed by her seeing some of the subject matter--perhaps because I was still in my teens? I don't know, it must be 15 years since I last saw it. It was the whole Frollo/Esmeralda thing, not to mention the terrible ending where everybody lives happily ever after, but Esmeralda goes off with Phoebus and it never even occurs to her that Quasimodo might be in love with her. Yeah. My Survivor posts are usually only about 1,000 words, so I can imagine what it's like to write such long ones. I may have to check out Hunchback again at some point. I was maybe 19 or 20 when I saw it, and it seemed to work. I do remember the ending being a bit abrupt and odd. I don't think the Pocahontas romance would work out so well for me, and the Mel Gibson factor adds another interesting wrinkle.